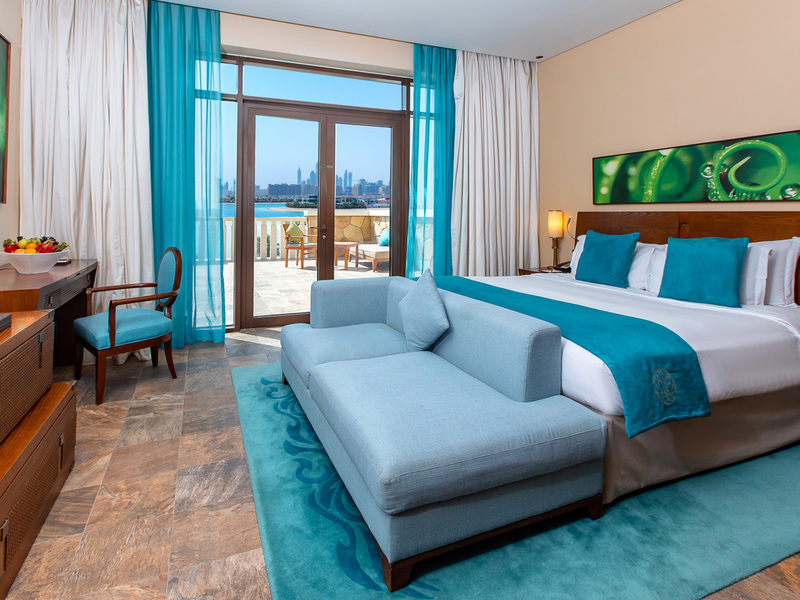 Be the first to discover Sofitel Dubai The Palm Resort & Spa, a unique luxury 5-star resort on Dubai's Palm Jumeirah island. 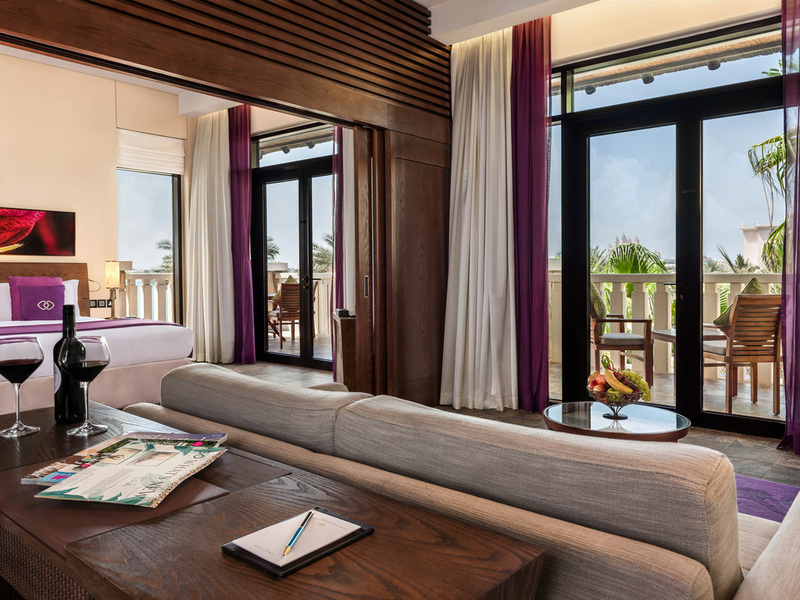 All 361 deeply comfortable rooms have balconies; suites boast 24-hour butlers and a private lounge. 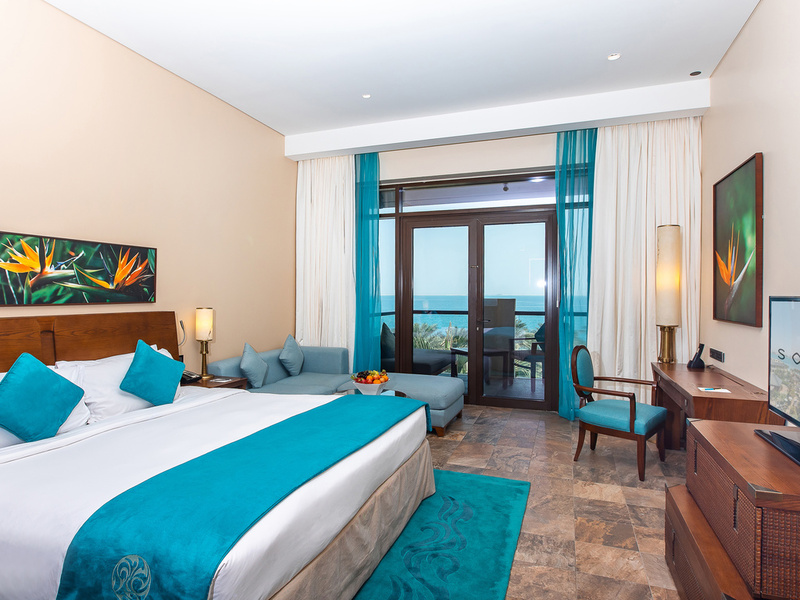 Indulge in a Beach Villa with a roof terrace and pool, or hotel apartments for longer stays in Dubai. Dine in a different part of the world every night with eight restaurants and seven bars and lounges. A ballroom hosts celebrations, while Inspired Meetings concierges offer creative incentive stays. Please join us for a Magnifique voyage to Palm Jumeirah's thrilling new resort, a paradise island where Polynesian style blends with refined French art de recevoir, Dubai's vibrant city life and state-of-the-art facilities. Life is Magnifique in Dubai.. Lose yourself in the lavishness of the delicious gourmet options available within the resort. 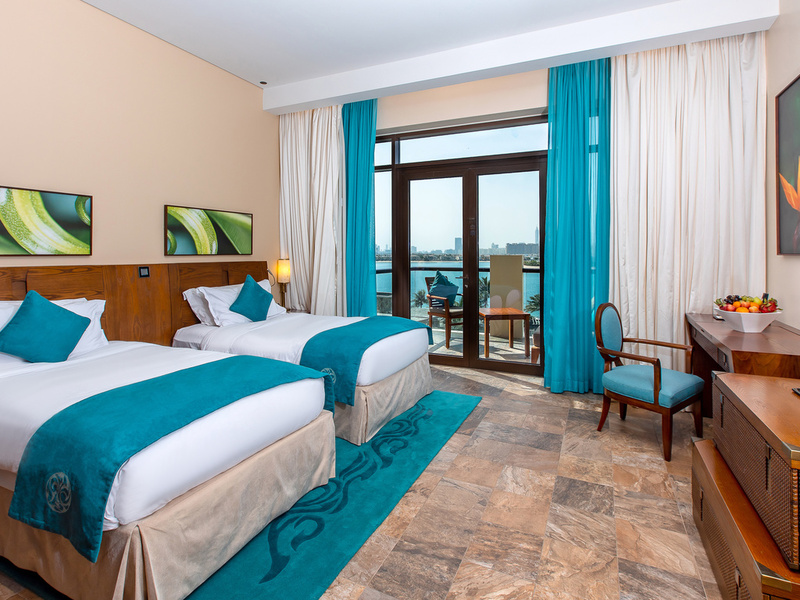 Indulge in a prime location, just minutes from luxury shopping, Dubai Marina and Media City. 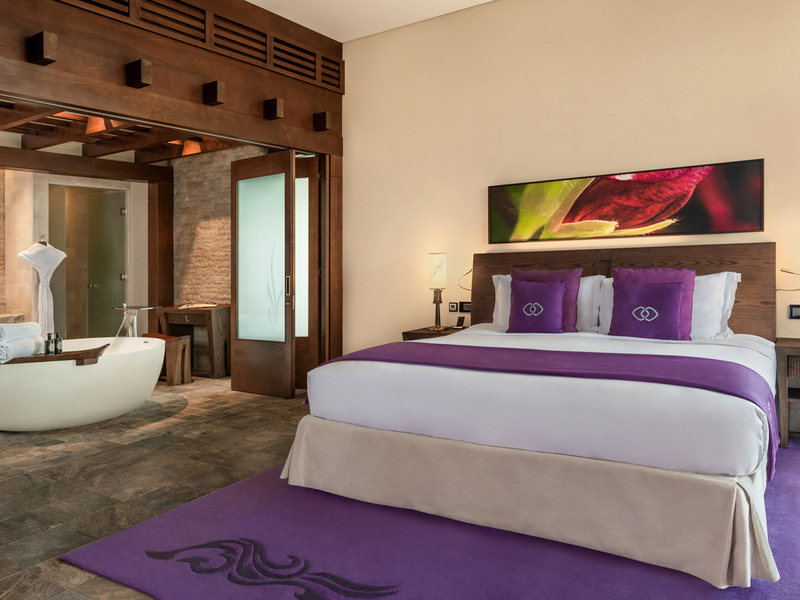 Immerse yourself in a luxurious, indulgent resort ambiance in a distinctive tropical setting. Each Sofitel is a unique blend of the French art de vivre and local refinement. 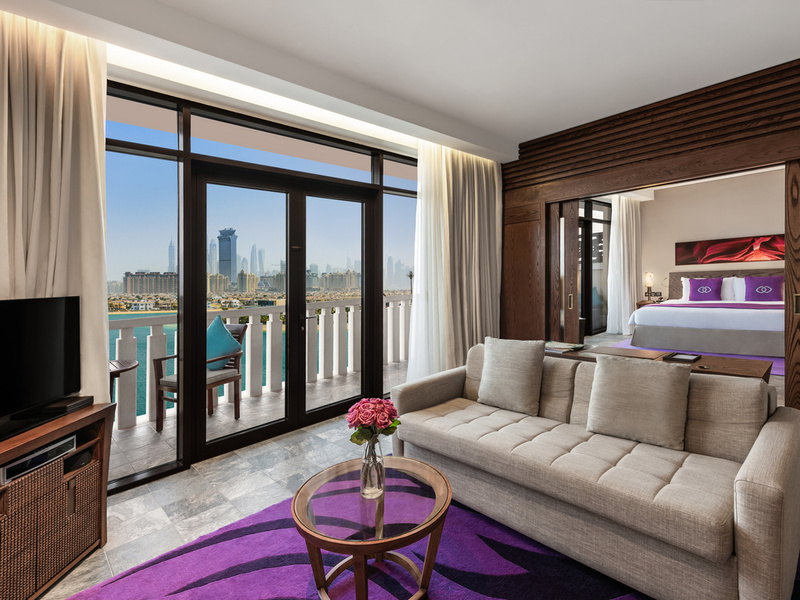 Sofitel Dubai The Palm Resort and Spa captivates you with French elegance, Polynesian ambiance and Arabian hospitality, in the East Crescent of Palm Jumeirah Island. The Polynesian-inspired architecture melds organic elements in a relaxing, refreshing environment with natural light. 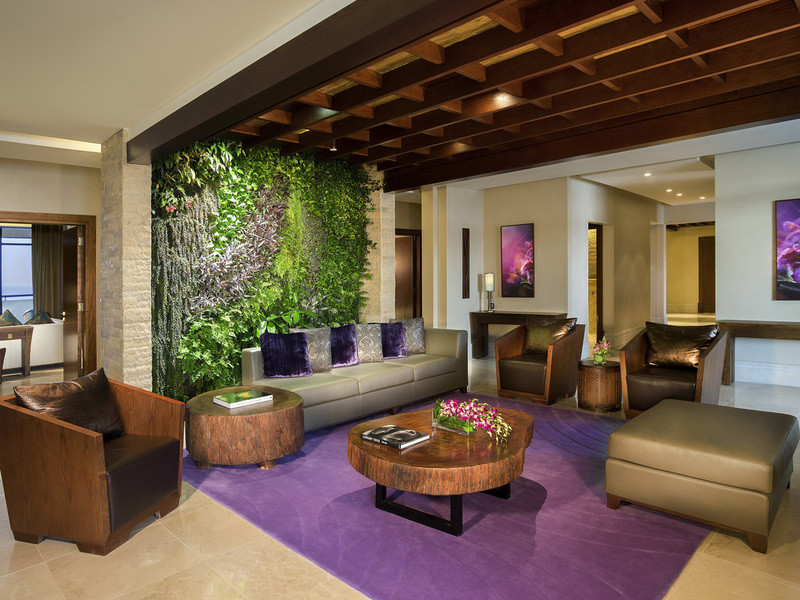 Softly cascading water features enliven the lobby, enveloping you in a cool setting. The luscious green of the vertical garden calms you. Natural, noble materials add texture and harmonize a soothing palette with touches of color, completing the refined, sophisticated décor of your room. The utmost care has created a design that blends nuanced French elegance and serene Polynesian comfort. Feast your eyes. The ivory sand on a private beach, mesmerizing turquoise waters of the Arabian Gulf and blue sky reflected in the swimming pools edged by vibrant vegetation, will envelop you. At night, the stars and the lights of Dubai gently twinkle. The facades of the skyscrapers mirror the blue of the sky and the turquoise waters of the Persian Gulf. With luxury boutiques, Michelin-starred restaurants and traditional souks, Dubai combines modernity with all the magic and mystery of the East. Retreat from Dubai's urban cityscape to Palm Jumeirah, a peaceful man-made island whose palm-like shape stretches far into the ocean. The low-rise resort sprawls over Palm Jumeirah's East Crescent, next to Aquaventure Dubai, close to the metro. Palm Jumeirah has easy access to central Dubai and Dubai airport (DXB). Take Jebel Ali exit over Al Gharoud Bridge onto Sheikh Zayed Road. After interchange 4, take Palm Jumeirah exit, through trunk then right on East Crescent. Airport pick-up available. 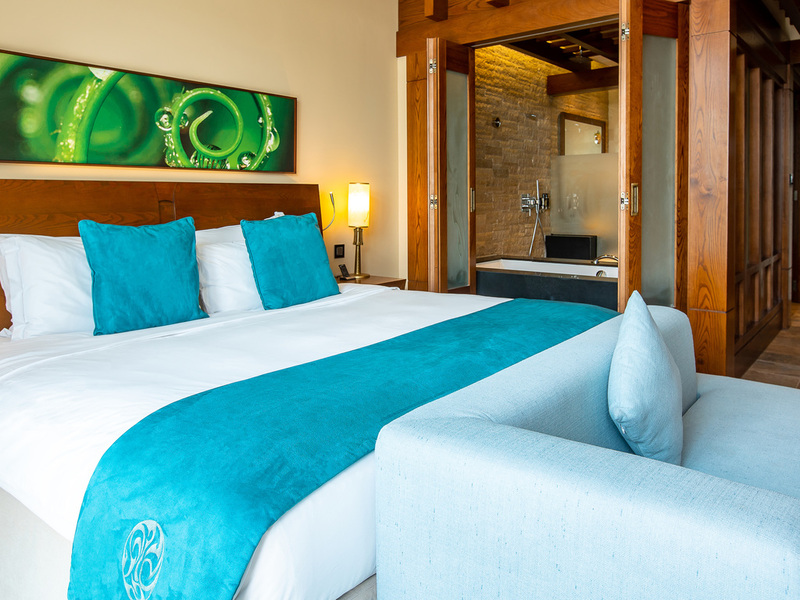 Treat yourself to luxury and comfort. 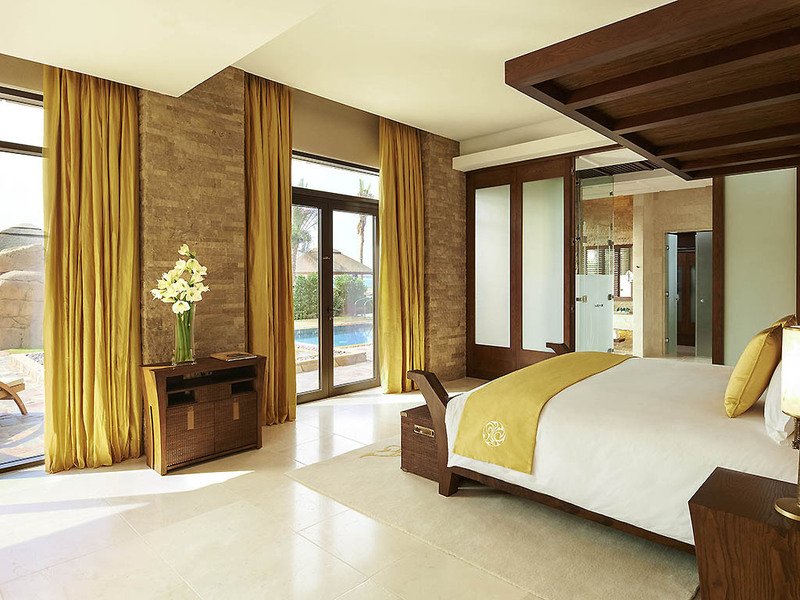 The richness of polished wood, marble, stone and leather in each seamless suite and villa delights and nourishes your senses. Sublime views of the Gulf and the Palm conjure up a magical space and cosset your soul. 44 m² /473 sq. ft. Polynesian-style room with balcony and sofa. Bathroom with tub and rain shower. Complimentary WIFI, 40'' TV, Bose Wave system, safe and minibar. Max. occupancy on existing bedding only. 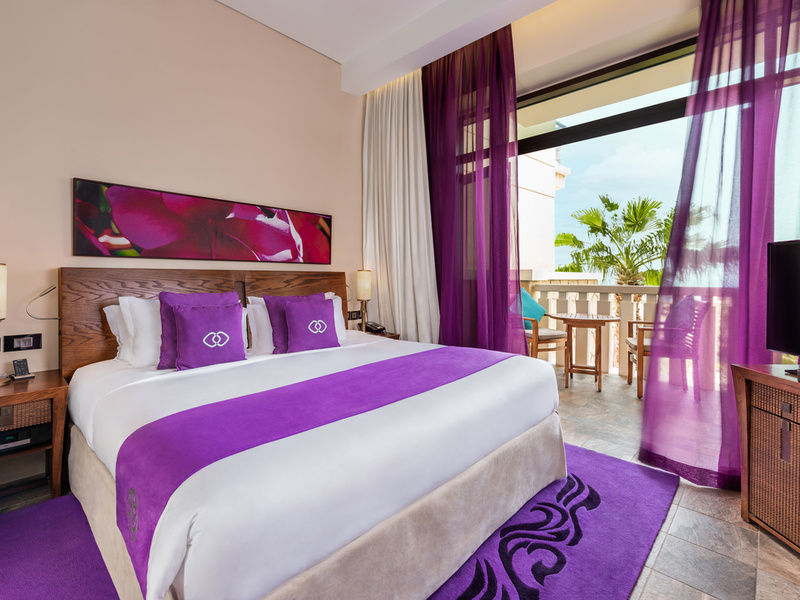 LUXURY ROOM SEA VIEW, 1 King Size Bed, Balcony, Private Beach access. 44 SQM / 473 SQF Room, Polynesian design, WiFi, BOSE music system, 40 inch TV, Rainshower and Bathtub, Luxurious bath amenities, Mini-Bar, Tea & Coffee machine, Kids Club & Private Beach access, Max occupancy on existing bedding only. LUXURY ROOM PALM VIEW, 1 King Size Bed, Private Beach access. JUNIOR SUITE SEA VIEW, 1 King Size Bed, Sofabed. 60 m²/645 sq. ft. Suite, Polynesian design with balcony, WIFI, BOSE music system, 40" TV, Sofabed, Rainshower and Bathtub, Luxurious bath amenities, Mini-Bar, Tea & Coffee machine, Max occupancy on existing bedding only. 85 SQM / 915 SQF Suite, Polynesian design with balcony, breakfast included,WiFi, BOSE music system, 40 inch TV, Sofabed, Rainshower and Bathtub, Luxurious bath amenities, Tea & Coffee machine, Max occupancy on existing bedding only. BEACH SUITE, 1 King Size Bed, Sofabed, Living Room. 85 m²/915 sq. 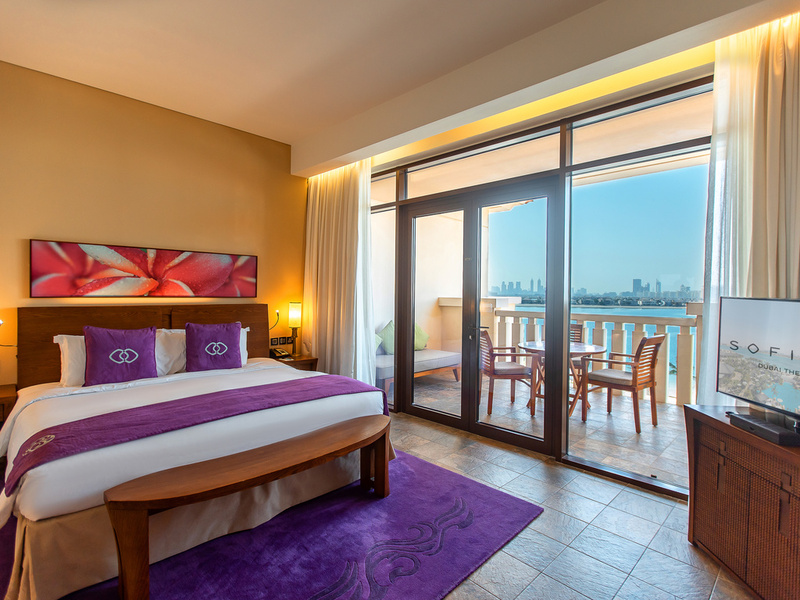 ft. Luxurious suite with a bedroom, living space and terrace overlooking the sea/Dubai skyline. Enjoy a world of privileges at Club Millésime, with breakfast, afternoon tea and happy hours. 125 SQM / 1345 SQF Suite, Polynesian design with balcony, WiFi, BOSE music system, 40 inch TV, 2 Bathrooms with Rainshower and Bathtub, Kid Club, Club Millésime & Private Beach access. Max occupancy on existing bedding only. THE PALM SUITE with Butler, 4 bedrooms, Balconies, Kitchen, Airport Transfer, Club Millésime. 450 SQM / 4845 SQF - Polynesian design Suite, 3 King and 2 Single beds and kitchen. Breakfast included, WiFi, bathrooms with bathtub, rain shower & luxury bathroom amenities, Bose Wave system, Nespresso coffee & tea facilities. Spa, Kids Club access. BEACH VILLA with Butler, 3 bedrooms, Terrace, Private Pool, Airport Transfer, Club Millésime. 345 SQM / 3715 SQF - Polynesian design Villa, 2 King and 2 Single beds, private pool, jacuzzi and terrace. Breakfast included, WiFi, luxury bathroom amenities, Bose Wave system, Nespresso coffee & tea facilities. Spa, Kids Club access. Should you wish to dine in the privacy of your room, our In Room Dining team is ready to serve you, day or night, from an extensive menu. Our dedicated Chefs are here to fulfill your culinary desires and satisfy your palate. Synonymous with the French art de vivre, culinary excellence is one of the cornerstones of the Sofitel experience. Sofitel The Palm Dubai is no exception with 7 restaurants combining to celebrate food with a French touch. A laid-back Polynesian vibe wafts through this Dubai resort's seven bars and lounges: order a cocktail, champagne or afternoon tea and unwind. A paradise for steak lovers, Porterhouse Steaks & Grills prepares prime cuts to perfection. A carefully crafted menu offers the freshest sushi, sashimi and ceviche in a graceful setting. Enjoy an aperitif, a rich cigar or flavorful shisha, or tea and coffee from inviting lounges. This is where music meets the ocean and delicious treats are paired with premium drinks, classic sundowners and shisha. Diners can enjoy seafood platters & lobster thermidor while our resident DJ plays your favourite beats. Olivier's is fully inspired by our Executive Chef, Olivier Chaleil - sharing his culinary expertise in creating an exquisite tailor-made menu. Open from 10AM to 8PM and ocated by the Kid's Club, Gelati corner offers a large choice of ice cream floavours and refreshments. Replay Sports Bar, the newest addition to our enticing dining experiences, features rustic interiors and brick walls as well as seven LED screens broadcasting your favourite games live in action. Hold Magnifique events and incentives in Dubai's newest conference facility. Sofitel The Palm's sparkling ballroom is ideal for weddings, meetings and multi-day conferences for up to 800. Incentive trips may involve water sports, golf or a desert safari. Dedicated InspiredMeetings planners focus on making your event in Dubai a success, whether it's a conference, a wedding banquet with live music and dancing, a glamorous fashion show or an intimate board meeting for high-level executives or diplomats. Enjoy specially designed menus, state-of-the art lighting and sound systems, a full-service business center and Wi-Fi in this brand new Dubai resort, where French savoir-faire helps turn business into pleasure. Enter a world of pampering and relaxation in So SPA, whose 2,500 square meters of space encompass a sauna, steam room, 28 treatment rooms. A unique spa experience on Dubai's Palm Jumeirah. A private 500 m beach and jetty, swimming pools, tennis, a golf excursion, sunset cruises, water skiing, fishing... A paradise resort in Dubai, steps from Aquaventure water park, where children and teenagers stay happy all day at the Kids Club. Explore Dubai and glide across town in a sleek private car. A chauffeured limousine service with a fleet of BMW and Cadillac cars, plus and stretch limos, is poised to whisk you wherever you wish. Simply ask the Concierge. Drink in the spectacular climate and unwind in heavenly swimming pools. The pools' carefully controlled temperature warrants pure bliss. Surrounded by luscious vegetation, tune into a softly cascading waterfall or ride the water slides with your children. Maintain your fitness regime in the hotel's high-tech So FIT gym, with state-of-the-art cardio machines, free weights and space for stretching and cooling down after your workout. Personal coaches are on hand to help plan your fitness session.